You can setup boot time scan to allow scanning for viruses at PC startup (when computer is swtiched ON). 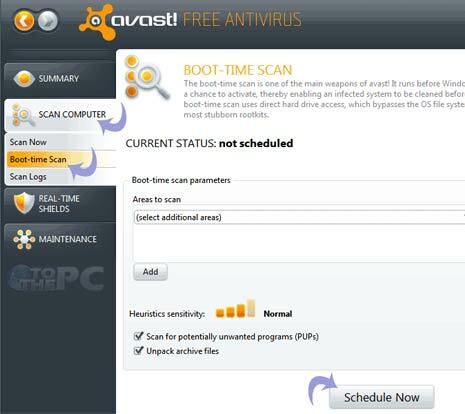 Free anti-virus software ‘Avast’ has this feature of Boot Time Scan. It scans your PC before the malware or virus is activated, hence cleaning the system before the system is acutally infected and damaged. In boot-time scan it uses the the hard drive access and bypasses the OS system drives. 1. Install Avast free antivirus (from avast.com) and Run it. 2. Click on Scan Computer in the Left pane of the window & click on Boot-time Scan. 3. Select the area that you want to scan from the drop down menu available. You can select the whole disk or some part of disk, or even the system files. You can add multiple files and folder in the boot-time scan. 4. Once done click on Schedule Now button at the bottom of the window. This will activate the boot time scan on your computer. Now when your PC is (re)started, Avast will run the virus scan before the windows is loaded.